Here you can find all information you need to a successful registration on the Alumni Hungary Portal. Let's start! After a quick, two round registration process, you can enjoy all functionalities on the Alumni Hungary Portal. So let’s see what you have to do reach full membership. Did you earn a degree in Hungary? After that a welcome e-mail will be sent to your e-mail address you have given in the first round of registration with a validation link. Please follow this link to confirm your registration. After clicking on the link, you will be immediately redirected to the portal, to you brand new alumni profile. (you do not have to log in again) From that point you are an active user. You can also add more information related to your professional experience and social media presence under the Short biography and Social media profile page, helping people to get in contact with you more easily. These remaining fields are not mandatory fields, but these can be also important in your networking activities, so these are suggested fields too. After you gave all information click on the green Save button to save your data. Of course after saving your profile, you can change your data anytime you want under the Edit my alumni profile menu. Enjoy your membership! Create groups and share alumni events! If you’re an active user, this means that you have already completed your first round of registration. 1. Log in with your data (e-mail address and password) that you have typed in during the 1st round of your registration. 2. 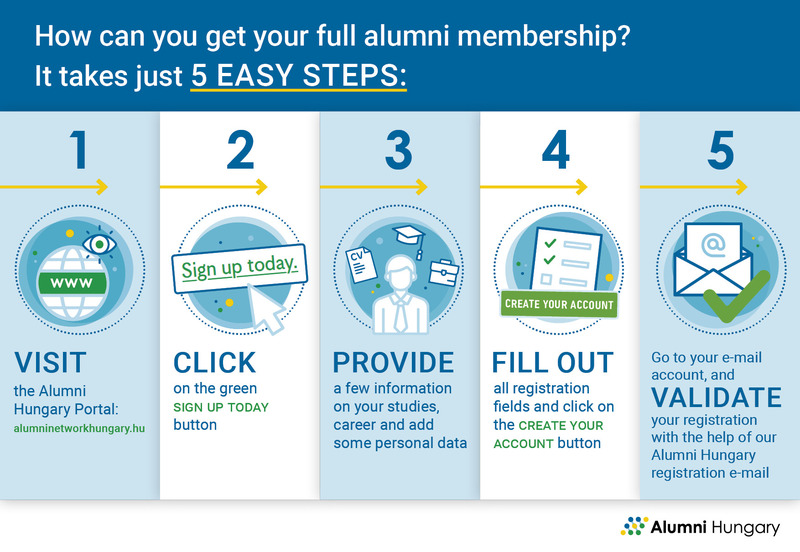 Now you are able to continue filling in your profile information in your alumni account. 3. Fill out the mandatory data fields in all categories (Personal, Studies, Employment). These data fields are marked with an *. The Short biography and the Social media section do not contain mandatory fields, but these can be also important in your networking activities, so these are suggested fields too. 4. After you gave all information, click on the green Save button to save your data. 5. Enjoy your member ship! Create groups and share alumni events! If you do not remember your password you can ask for a new one under the log in section, choosing the Reset your password option.